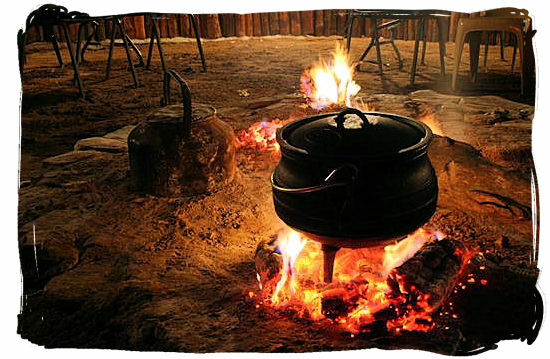 I would like to share a bit of my culture with you….the theme is African…..Today, cooking up a “potjie” has evolved into a unique South African social happening, a tradition almost as popular as the legendary “Braai” (barbecue). Family and friends are invited and they all settle around the fire with the softly bubbling “Potjie”, chatting, enjoying a drink and having a great time, while the aroma escaping from the “potjie”, does its work. The range of different recipes is as wide as the imagination stretches and every “potjie” expert has his or her own secrets and special recipes. 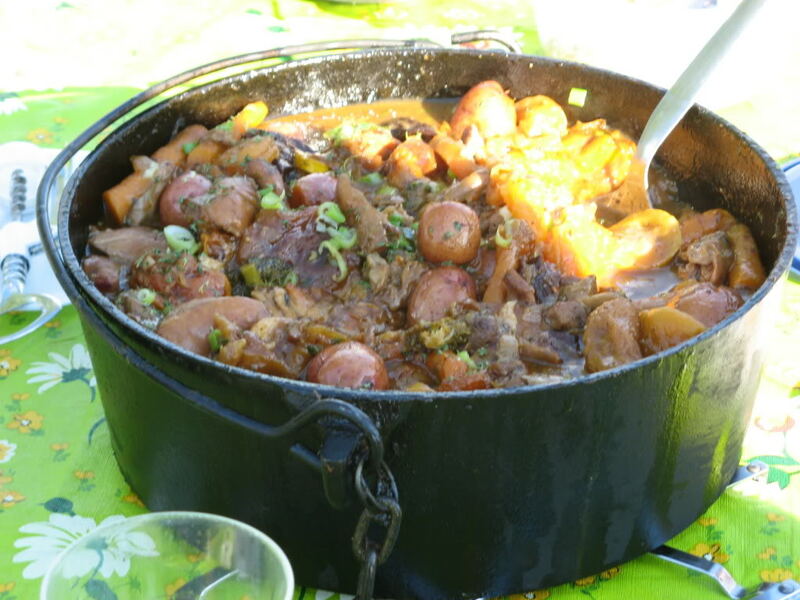 The best meat to use for “potjiekos” is what is known as stewing beef, sinewy and gelatinous cuts of beef which become deliciously tender when simmered for a long time, developing a strong meaty flavour. 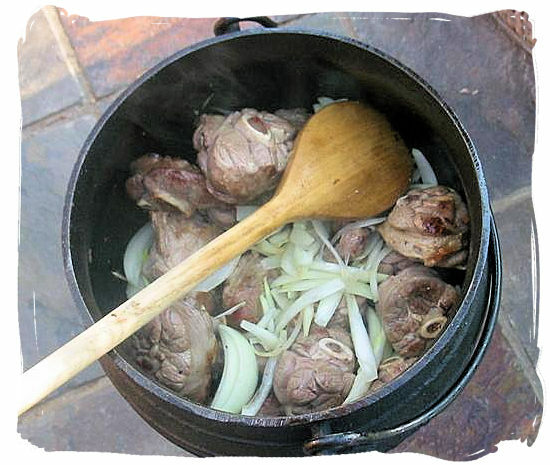 Other meat such as mutton, chicken and even fish make ideal “potjies”. The fire is an important part of creating a culinary “potjie” masterpiece. Unlike a “braai”, the choice of wood or charcoal does not make much difference, as long as you can regulate the heat. 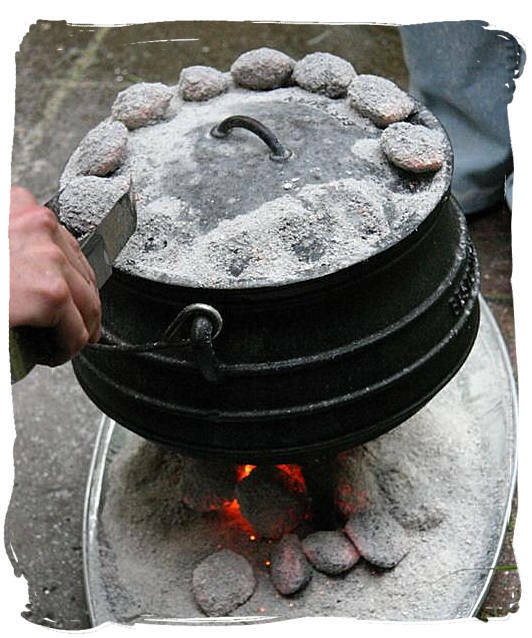 That is done by adding or removing coals once the “potjie” is heated up. You only need a few to keep the “potjie” simmering. A good idea is to keep a separate fire going to provide the necessary coals. Keep in mind to season or “cook-in” a new “potjie” to get rid of any iron filings and other unwanted residue. The packing of the food in layers is the other important part. The meat usually comes first. Add a dash of cooking oil or some fat in the pot, add meat the meat and brown thoroughly. This is essential to seal-in the flavour and improve the appearance of the meat. Cook the meat till nearly done. Add onions, garlic, herbs and spices and sauté. Finally add a little red wine or some meat stock, only a small amount of liquid is needed and stir. Most important, do not stir again until the food is ready to be served. 1. Heat the oil in a medium-size potjie, then fry the onions, bacon and lamb chops for about ½ hour, stirring from time to time. Cover with lid and leave to cook for about 45 minutes. 3. Cover with lid and cook for about another 2 hours slowly over medium coals ; check if there’s enough water after a while, and add more if necessary. 4. Stir through ; the meat should fall off the bones. 5. Serve with brown rice and sweet mashed cinnamon pumpkin. “Potjie” is a 3 legged round-bottomed cast iron pot where you put your ingredients in, and it simmers merrily over coals while everyone sits around it chatting away. and sipping you know what.. It’s much more sociable than a BBQ and everyone usually gather round the fire and having a great time. I am not sure if you can buy “Potjies” outside of South Africa, but any large pot with a thick base and a lid should do. This entry was posted on July 12, 2010 at 6:27 am and is filed under Cooking, Family, Friends, Life, People, Personal, Random, Recipe with tags bacon, cabbage, Lamb Neck, open fire, potatoes, Potjie. You can follow any responses to this entry through the RSS 2.0 feed. You can leave a response, or trackback from your own site. Your recipe is similar to how I made beef stew, only I do mine in the oven. I am however, going to be on the hunt to see if I can find a pot like yours…what a great way to do a meal while sitting by the fire! Wow, I didn’t know you did recipes on your blog, too! Fantastic :3 Keep it up, looks delicious! I got referred to this place via deadpoet88, and I’m suitably impressed. You’ve got some stunning photography to take in on here.